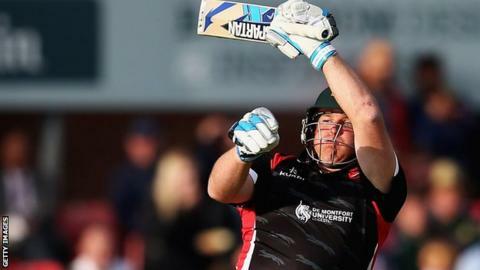 Leicestershire's top-order batsmen are failing to take responsibility, according to captain Mark Cosgrove. The Foxes suffered a fourth straight defeat in the One-Day Cup on Tuesday, posting just 156 against Derbyshire and losing by six wickets with 19.1 overs to spare. "Everyone got a start but someone has to put their hand up and go on with it," Cosgrove told BBC Radio Leicester. "If the top three of four don't get a score you struggle in one-day cricket." The defeat at the 3aaa County Ground all but ended Leicestershire's involvement in the competition, despite some close results earlier in the group stage. "We have been close and that is the story of the season but close isn't good enough," Cosgrove added. "You don't get points for being close in games. We have to finish games off."